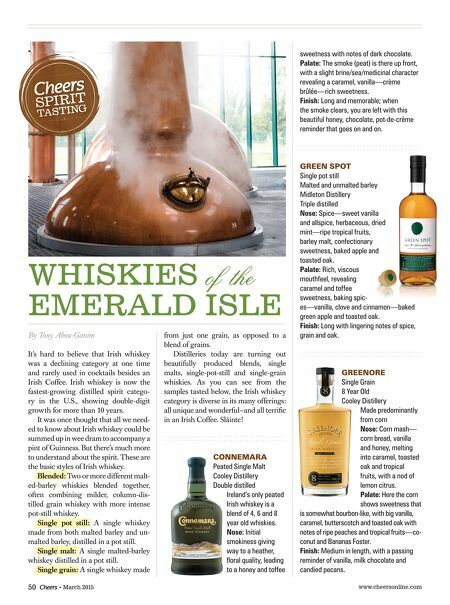 www.cheersonline.com 51 March 2015 • JAMESON BLACK BARREL Blended, pot-still and grain whiskies Midleton Distillery Triple distilled Sherry and specially se- lected toasted and charred used bourbon barrels. Nose: Rich fl oral notes —honeysuckle, fresh-cut grass—orange marmalade, light spice, toasted oak, stewed fruits—nectarines, apricots and tropical fruits such as papaya. Palate: Nice texture, well-balanced, ripe tree fruits—peach and apricot, toasted nuts, sweet sherry, caramel sweetness and a touch of vanilla followed by toasty oak and malty grain. Finish: Long in length with a pleasant spice, toasted oak and fruit reminder and a touch of honey sweetness. KILBEGGAN Blended, malt and grain whiskies Cooley Distillery Double distilled Nose: An earthy, green vegetal note, followed closely by sweet sherry, stewed prunes, lemon zest, toasted oak and malty grain. Palate: Big vanilla, custard, cocoa and caramel sweetness, followed by ripe peaches and an almond nuttiness. Finish: Medium in length, dry with a sweet nougat and oak reminder. MIDLETON VERY RARE Blended Midleton Distillery Triple distilled Whiskies range from 12 to 25 years in age; just 50 casks are released each year. Nose: Big and complex, notes of spice, bright citrus—lemon and lemon zest—fl o- ral, herbal, toasted oak, grainy cereal mash. Palate: Rich, full and creamy revealing honey, toffee, butterscotch sweetness, lush, ripe summer tree fruits, white pepper spice, with a hint of vanilla and toasted almonds. Finish: Very long, with a sweet/spicy reminder. REDBREAST Single Pot Still Malted and unmalted barley 12 Years Midleton Distillery Triple distilled Nose: Complex with fruity aromas of stewed cherries and plums, cit- rus peels, sweet orange, big spice—clove and white pepper—toasted oak, sweet sherry. Palate: Lovely, creamy texture, rich honey sweetness, ripe tree fruit—peaches, bright orange citrus notes, raisins, custard, toasted nuts and marzipan. Finish: Long, with all of the fl avors continu- ing to linger in beautiful harmony. TEELING Small batch, blend of malt and grain whiskies Teeling Distillery Malt is double distilled; grain is triple distilled Finished in used rum casks for 6 months and bottled at 46%. Nose: A slight malty note, followed by baked apple, vanilla, baking spices, sweet rum and a fl oral bouquet of orange blossom. Palate: Medium bodied with a pleasant blast of spice—ground cinnamon and vanilla—lemon curd, blackberries, toasted wood and dried fruits. Finish: Medium in length, with a sweet caramel and dried herbal reminder. TULLAMORE D.E.W. 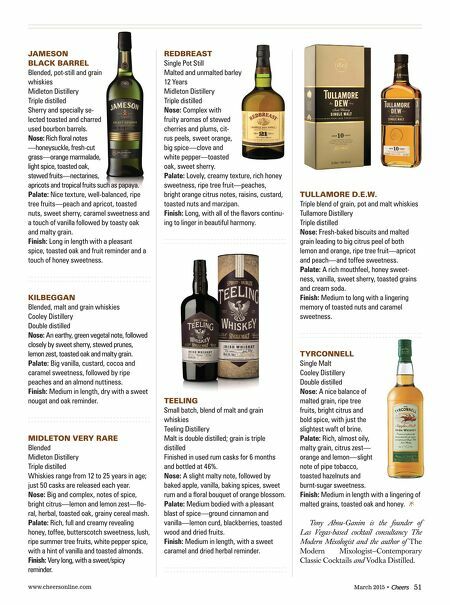 Triple blend of grain, pot and malt whiskies Tullamore Distillery Triple distilled Nose: Fresh-baked biscuits and malted grain leading to big citrus peel of both lemon and orange, ripe tree fruit—apricot and peach—and toffee sweetness. Palate: A rich mouthfeel, honey sweet- ness, vanilla, sweet sherry, toasted grains and cream soda. Finish: Medium to long with a lingering memory of toasted nuts and caramel sweetness. TYRCONNELL Single Malt Cooley Distillery Double distilled Nose: A nice balance of malted grain, ripe tree fruits, bright citrus and bold spice, with just the slightest waft of brine. Palate: Rich, almost oily, malty grain, citrus zest— orange and lemon—slight note of pipe tobacco, toasted hazelnuts and burnt-sugar sweetness. Finish: Medium in length with a lingering of malted grains, toasted oak and honey. Tony Abou-Ganim is the founder of Las Vegas-based cocktail consultancy The Modern Mixologist and the author of The Modern Mixologist—Contemporary Classic Cocktails and Vodka Distilled.